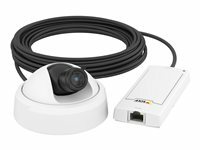 AXIS P12 Network Camera Series offers small-sized, high-performance cameras for exceptionally discreet indoor and outdoor surveillance. The cameras’ unique and functional design allow them to easily blend in to a variety of environments, making them ideal for discreet and covert surveillance in stores, architectural buildings, hotels, offices, banks and ATMs. Miniature HDTV pinhole camera for discreet surveillance. Cable from sensor unit going in the direction of the lens. Edge storage using microSD card or NAS. ACAP support, I/O port, multiple video streams in H.264 and Motion JPEG. 25/30 fps in all resolutions up to 720p. PoE and 8-28 VDC support. Eye-level identification Discreet, pinhole cameras mounted at eye-level capture vital facial details from a natural angle for enhanced security and identification. Axis' Corridor Format Axis' Corridor Format provides a vertically oriented video stream, perfectly adapted to narrow areas - maximizing image quality while eliminating the typical bandwidth and storage waste of landscape formats. HDTV Image quality Crystal-clear HDTV 720p image quality with backlight compensation makes positive identification easy, regardless of lighting conditions. Tampering alarm Automatic alerts ensure your surveillance system always works, and can also indicate crimes in progress so you can take immediate action. Efficient video compression AXIS P12 cameras deliver multiple, individually configurable video streams in H.264 compression, which greatly optimizes bandwidth and storage needs without compromising image quality. Flexible mounting Since the AXIS P12 sensor unit and main unit are separate and only connected by one 8-meter (26 ft.) cable, you can safely place the main unit within bank walls while the sensor unit is installed in the ATM. Edge storage With the cameras' built-in microSD/microSDHC card slot for video storage, there's no need for additional equipment like DVRs - saving you money and space. It can also serve as a backup in case the primary storage fails. Remote access With remote access to live and recorded video, you can facilitate quick investigations and save on resources. There is no need to wait for a security team to open an ATM and retrieve the video. 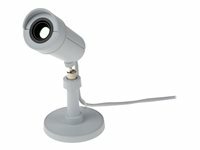 Wide-angle miniature camera AXIS P1224-E comprises a tiny HDTV 720p camera with a wide 145° horizontal field of view - ideal for unobtrusive, overview surveillance. The IP66-rated camera can be used indoors or outdoors, flush-mounted in walls, ceilings, elevators, or in limited spaces such as in ATMs (automated teller machines). It is ideal for use in banks, stores, architectural buildings, hotels and offices. 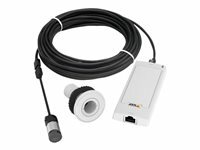 Easy and flexible installation AXIS P1224-E consists of two parts: a sensor unit cable, and the main unit (with network, power and input/output connections and a memory card slot). The cable connects the two parts, enabling the sensor unit to be installed discreetly in tight places, and the main unit to be placed elsewhere. HDTV 720p AXIS P1224-E network camera provides full frame rate HDTV 720p (1280 x 720 pixels) video in H.264 and Motion JPEG. 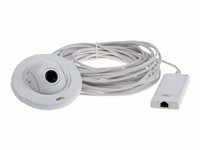 Other supported features include video motion detection, active tampering alarm, and input/output ports for connections to external devices. 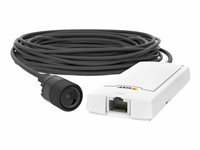 Extremely discreet installation AXIS P1264 network camera is a cost-effective and extremely discreet pinhole camera with high performance. Comprising a sensor unit and a main unit, the indoor camera is ideal for use in stores, ATMs, and ticket, vending and health monitoring machines. Pinhole sensor unit The sensor unit can be mounted in tight places, and behind a metal, plastic or glass panel. The sensor unit provides a 57° horizontal field of view and color video in low light. Compact main unit The main unit, with compact dimensions makes it easy to install in tight places. 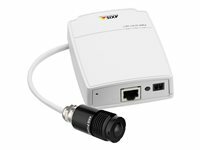 It provides high-quality video and is powered through Power over Ethernet (PoE). It has a built-in microSD card slot for local storage of recordings. Savings with Axis' Zipstream technology AXIS P1264 supports Axis' Zipstream technology, which is a more efficient implementation of the H.264 video encoder. It can lower bandwidth and storage use for many surveillance scenarios. The encoding technology ensures that important details are maintained while unnecessary data is heavily compressed. Cost-effective and discreet installation AXIS P1244 is a small, cost-effective modular camera with HDTV 720p performance. The indoor camera is ideal for use in highly discreet installations such as in retail stores, banks and museums, and for installation in tight places such as in ATMs (automated teller machines), ticket, vending and health monitoring machines. Modular concept AXIS P1244 is composed of the following: an AXIS F1004 Sensor Unit, comprising a lens and image sensor, and AXIS P12 Mk II Main Unit, which is the body of the camera. The sensor unit comes with a detachable 8-m (26 ft) cable for connection to the main unit. The cable enables the main unit to be placed away from the viewing point where there is space. Small sensor unit The thumb-sized sensor unit offers a 102° horizontal field of view and provides color video in light as low as 0.4 lux. The sensor unit can be integrated in machines, or mounted in doorways, walls and ceilings with the flush mount kit. Compact main unit The main unit, with dimensions of 1.7 x 4.6 x 11 cm (5/8 x 1 13/16 x 4 5/16 in. ) makes it easy to install in tight places. It provides HDTV 720p videos and is powered through Power over Ethernet (PoE). It has a built-in microSD card slot for local storage of recordings. Savings with Axis' Zipstream technology AXIS P1244 supports Axis' Zipstream technology, which is a more efficient implementation of the H.264 video encoder. It can lower bandwidth and storage use by an average of 50% or more for many surveillance scenarios. The encoding technology ensures that important details are maintained while unnecessary data is heavily compressed. Highly discreet installation AXIS P1245 Network Camera includes a thumb-sized sensor unit, a compact main unit, a mounting bracket and locking nuts for easy installation. Together, these discreet components help the camera meld into any environment. For example, it's suitable for mounting in ticket machines, in healthcare monitoring equipment, in ATM machines and behind walls and ceiling panels. 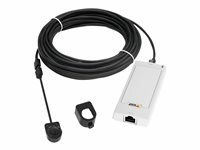 Plug-and-Play modular design AXIS P1245 comes complete with a sensor unit, an 8-meter cable and a main unit with network and power connection as well as a memory card slot. It's easy to buy - because they put everything you need right in the box. Don't miss a thing AXIS P1245 provides a wide 111° horizontal field of view and HDTV 1080p for excellent video quality. It is equipped with Wide Dynamic Range - Forensic Capture, which enables the camera to handle scenes with strong variations in light. AXIS P1245 also offers good color video in low light. Keep it discreet, flexible and easy AXIS P1245 can be installed in tight places, behind glass or plastic sheet. The camera comes with a detachable cable that connects the sensor unit to the main unit for flexible installation. This also simplifies maintenance and enables the use of accessory cables. Compact main unit The main unit, with dimensions of 1.7 x 4.6 x 11 cm (5/8 x 1 13/16 x 4 5/16 in. ) makes it easy to install in tight places. 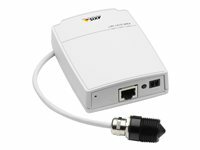 It provides HDTV 1080p video and is powered through Power over Ethernet (PoE). It has a built-in microSD card slot for local storage of recordings. 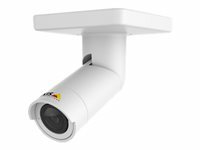 Discreet varifocal dome camera AXIS P1275 Network Camera is a palm-sized dome that's designed for surface mounting. It's excellent for overview or close-up applications. For example, it's suitable for passport control or security control areas and in banks. It's also particularly suitable when you want an unobtrusive camera that's nevertheless visible enough to act as a deterrent. 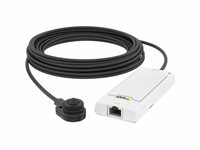 Plug-and-play modular design AXIS P1275 comes complete with a domed sensor unit, an 8-m/26-ft cable and a main unit with network and power connection as well as a memory card slot. Keep it discreet, flexible and easy The sensor unit can be tilted to optimize the installation, and the 2.8-6 mm varifocal lens can be redirected, re-zoomed and focused after mounting, which makes it an excellent choice when you need flexibility. The camera comes with a detachable cable that connects the dome sensor unit to the main unit for flexible installation. This also simplifies maintenance and enables the use of accessory cables. Where privacy is paramount AXIS P1280-E can be used as a sensor to avoid compromising privacy, for example schools and care homes - thermal imaging detects incidents without revealing personal details of the people in the image. Together with analytics the thermal camera can trigger alerts or alarms in response to patient or resident falls, allowing staff to take immediate action. Flexible and discreet AXIS P1280-E is small in size and extremely discreet. Mount it behind surfaces, on walls or inside a bullet-shaped accessory - whichever best suits your requirements. Thermal detection within reach AXIS P1290 delivers all the benefits of thermal detection at a price that's within reach. Thanks to built-in analytics it reliably detects people, vehicles and objects regardless of light conditions or attempts at camouflage. It can be used as a cost-effective detector with visual confirmation for safety of both people and property in numerous environments. It also helps to decrease false alarms. Where privacy is paramount AXIS P1290 can be used as a sensor to avoid compromising privacy, for example schools and care homes - thermal imaging detects incidents without revealing personal details of the people in the image. Together with analytics the thermal camera can trigger alerts or alarms in response to patient or resident falls, allowing staff to take immediate action.